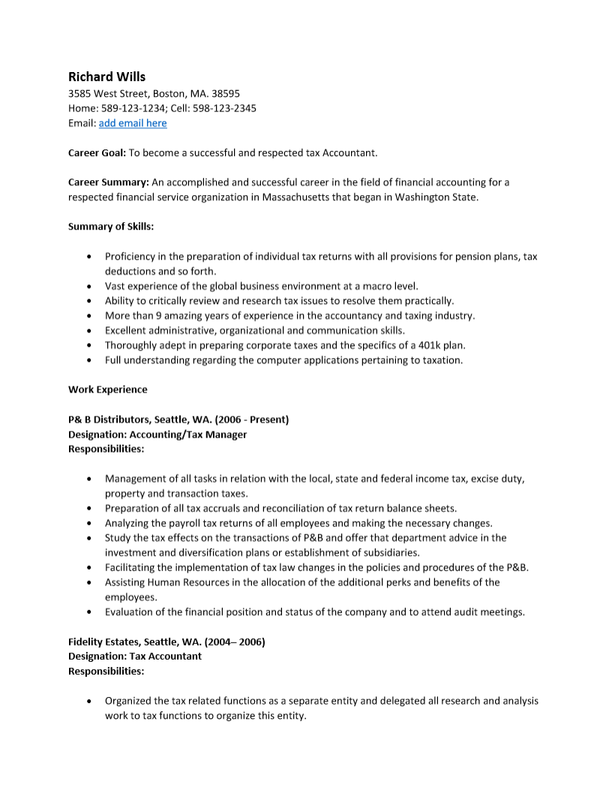 The Tax Accountant Resume Template provides the sections necessary to create a resume document with a reusable form. This form will act as a guideline on how one should divide their information and credentials. 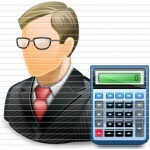 Tax accountants are primarily concerned with their client’s taxes. This means they will need to be fully up to date with the current tax law on all levels (federal, state, and local). They will also need to be fully abreast of their clients’ finances, operations, and needs. These are just some of the subjects that will fall under a tax accountant’s scope of knowledge. 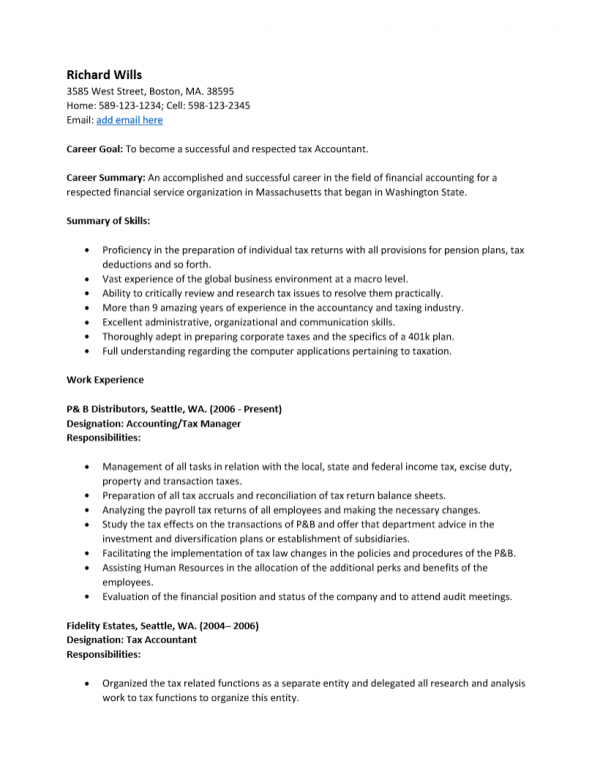 Tax accountants will need to show they are organized, meticulous, and possess excellent memory skills. A resume must give the impression the sender is capable of all of this and more. That is, the presentation of the resume and the timeliness will also be factors in considering this document a high quality resume. The true power of this template is that it is reusable. This means that the basic formatting and headings of the resume a user created with this template may easily be updated by simply copying and pasting parts of it into a blank form. This can save a bit of time when revising a resume while maintain the overall quality. Step 1. The first line is where you will enter your full name. The following lines are where you will enter your contact information. Step 3. The “Career Summary” section will be a brief one to three sentence summary of your professional identity. Step 4. The “Summary of Skills” section will highlight some of the experience, knowledge, and skills you have gained in your professional life. Step 3. The “Work Experience” section is your professional history. This will be where you inform a potential employer of your professional history. The content will consist of several entries. Each will be a previous employer and (as a whole) presented in reverse chronological order. Each employer should have their name, location, and the time they employed you on the top line. Your official job title should be listed next to “Designation.” Below the sub-heading “Responsibilities” should be a detailed list of how you spent your time there. Step 4. The next two sections, “Educational Profile” and “Technical Skills,” are where you will list your academic credentials and your knowledge of software and accounting tools respectively.